Facebook announced Wednesday that their messenger app has got a major update which lets its users send text messages to each other even if they are not friends on the Social network. The new Facebook messenger can now be compared to other mobile messengers like Whatsapp and Snapchat as you can now easily send text messages to anyone on Facebook, even if they are not your friends. The new Facebook messenger can allow you to send messages to anyone on Facebook provided you have their phone numbers. The updated Facebook app scans and syncs with your mobile phone contacts and allow you to send messages to anyone on our phone contact even if they are not your friends on Facebook. By using the new Facebook messenger to send messages to anyone on your contacts, you save yourself the SMS charges just like Whatsapp, WeChat and Snapchat. Facebook understands the need of the young ones in maintaining communication with their friends at all times and this is evident from the way the Facebook messenger has evolved from a desktop chat client to a messaging app on mobiles. The new Facebook messenger app is designed to be fast, free & reliable and can work without the usual other content on Facebook like the news feed and timeline profiles. The logo is also changed from the normal Facebook logo color to a more distinctive Skype blue color. The Facebook messenger icon will appear next to the name of anyone that has downloaded the messenger app, and when you send messages to such persons they will receive a notification instantly just like in Whatsapp. When a message is sent to you, you will receive an instant notification. Tap on the text message notification to open the text automatically in messenger. Not everyone can send text messages with the new Facebook messenger now. 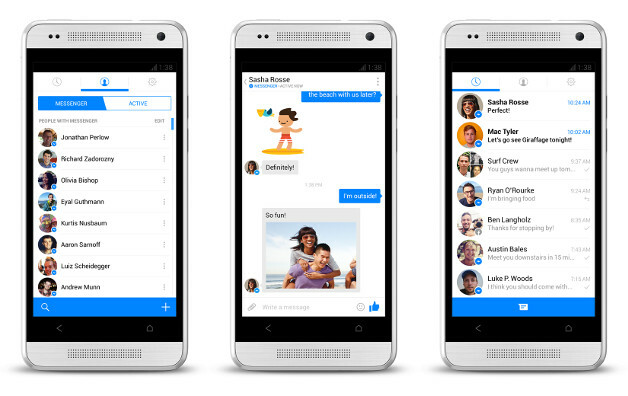 The new Facebook messenger lets you text anyone in your phone contacts as well as message any friend on Facebook. There are also extra features like the audio messaging, free calls, read receipts, location sharing, private photo sharing and more. Facebook believes this will increase engagement between its users. Once you update or install the new Facebook messenger app, you will be required to enter and verify your phone number, and then your mobile contacts will be synced so Facebook can use the phone numbers to find your friends with their linked numbers in the Social media giant. Your number is defaulted to the “Only Me” privacy setting on your profile meaning no one will have access to it. Download Facebook messenger for iOS. So Facebook copied what is trending right now. The chat with phones via Whatsapp and Snapchat . I guess this is how business works, sometimes. Well i haven’t used facebook messenger from along time seems like it has improved its features. The post is really helpful to know about the new feature for sending the messages without phone numbers. Thinkers always follow the trend in an unusual way. I think i like this new development. As long as no one will see my number. Does it have any specification or is it compatible with all smartphones. I thnk it should be included in this post. Just a suggestion :). Even Facebook did not specify that, check the download page. Thanks. I’ll do jut head over to the download page. OK my man, hope to see you around more often.